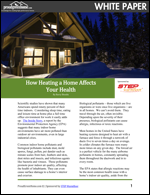 Most homes in the United States have heating systems designed to heat air with a furnace that forces air through a network of ducts. However, a report by the EPA suggests that many indoor home environments have air more polluted than outdoor air environments. This white paper identifies the health issues associated with poor indoor air quality and identifies an alternative heating approach that creates a healthier indoor environment.